Despite Ned Flanders’ religious benevolence and gentle demeanor, he tends to inspire quite a bit of musical hate. With an assist from David Byrne, Homer Simpson expressed frustration toward his neighbor with the castigation “Everybody Hates Ned Flanders.” And in real life, there’s now an aggressive Phoenix quintet called Okilly Dokilly, which calls itself “the world’s only Nedal band.” Besides appropriating Flanders’ slang, the band members—dubbed “Head Ned,” “Bled Ned,” etc.—mimic his fashion sense: All sport dark-green sweaters, a pink collared shirt, bushy mustaches, and dorky glasses. 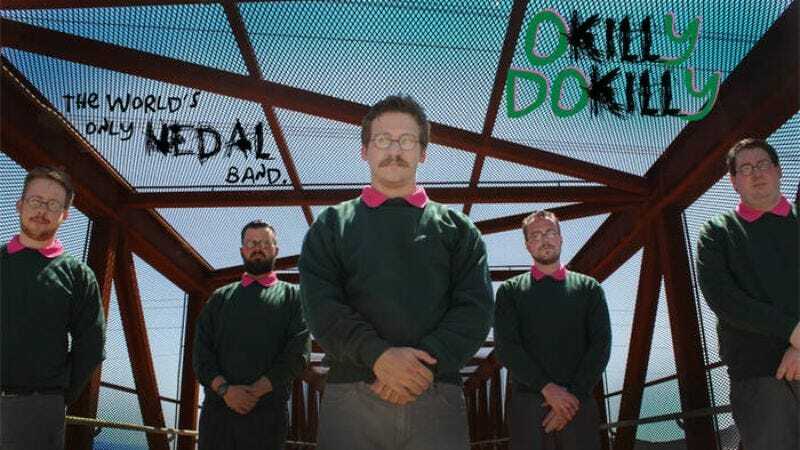 Accordingly, Okilly Dokilly’s demos liberally quote Flanders lines as they incorporate elements from screamo, acoustic hard rock, and stoner rock in addition to good old-fashioned heavy metal. And believe it or not, they aren’t the only hey-diddly-ho hard rock band floating around: Back in 2001, a group known as Ned Zeppelin closed out a U.K. Christian music festival’s Flanders tribute day with a set reportedly featuring hybrid songs such as “A Whole Lotta Ned.” Godspeed, li’l doodle!